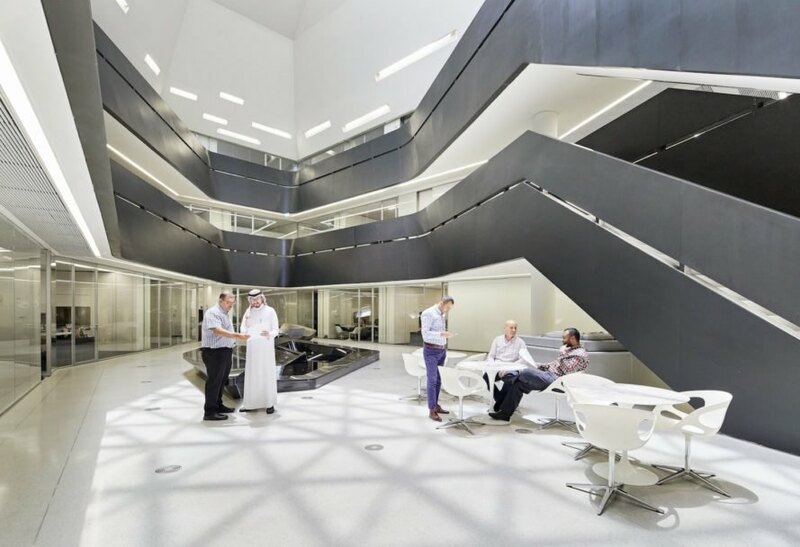 Despite its name, the King Abdullah Petroleum Studies and Research Centre (KAPSARC) is big on renewable energy, as evidenced by its LEED Platinum certification—the first of Zaha Hadid Architects’ projects to receive the title. Located in the Riyadh Plateau, KAPSARC is a non-profit dedicated to studying energy and their environmental impacts. The futuristic, crystalline campus recently opened to the public for Saudi Design Week 2017, and the Honeywell Smart Building Awards program named the project Saudi Arabia’s ‘smartest’ building due to its many eco-conscious features. 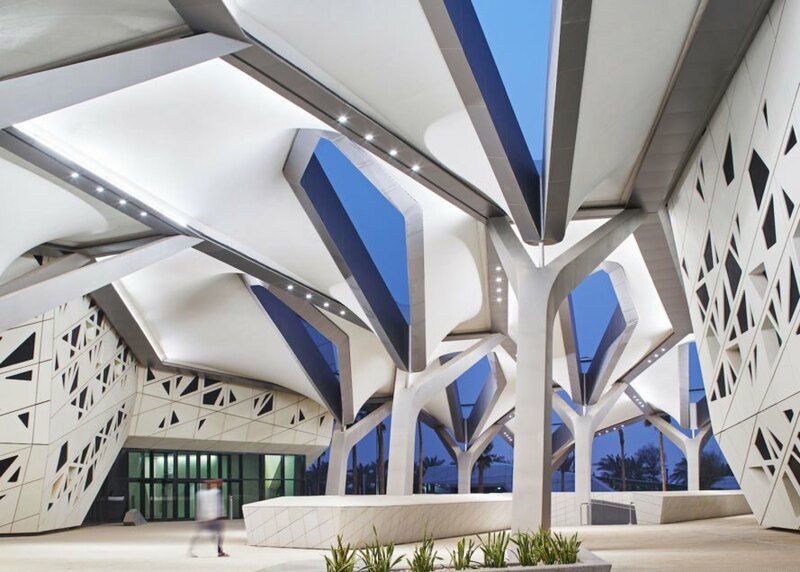 Made up of white hexagonal prismatic honeycomb structures, KAPSARC uses its partially modular system to optimize solar orientation, increase connectivity, and maximize daylighting. The building massing and facade optimization helped the structure achieve a 45% reduction in energy performance (compared to the ASHRAE baseline standards), while the solar array that tops a south-facing roof provides renewable energy with a capacity of 5,000MWh per year. 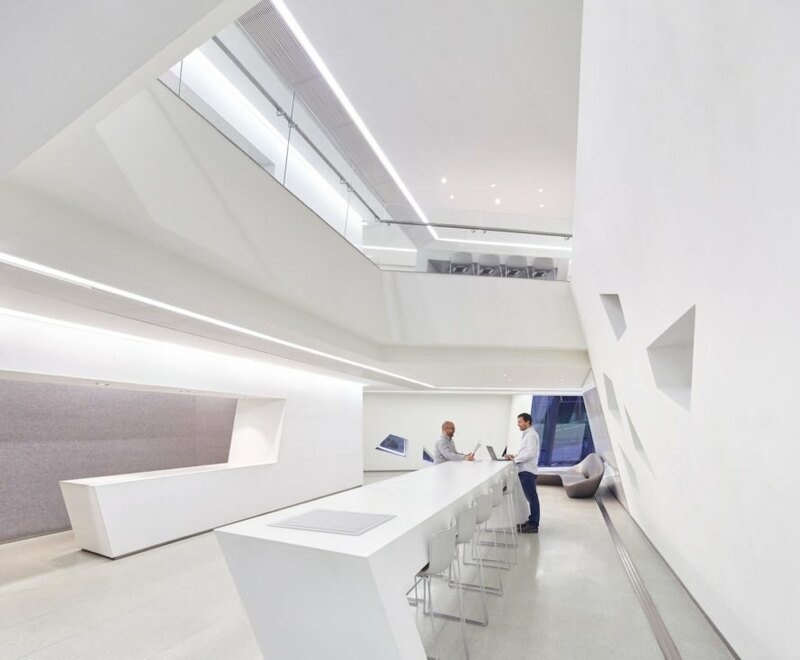 “A research centre is by its very nature a forward-looking institution and KAPSARC’s architecture also looks to the future with a formal composition that can be expanded or adapted without compromising the centre’s visual character,” wrote the architects. The 70,000-square-meter campus comprises five buildings: the Energy Knowledge Centre; the Energy Computer Centre; a Conference Centre with exhibition hall and 300-seat auditorium; a Research Library with archives for 100,000 volumes; and the Musalla, an inspirational place for prayer within the campus. Each building differs in size and is flexible enough to adapt to different uses or changes in requirements. The facade features a strong protective shell to shield the interior from the harsh climate. All KAPSARC’s potable water is recycled and reused onsite while all of its irrigation water is used from non-potable sources. Forty percent of the campus’ construction materials were locally sourced and thirty percent of the materials are made with recycled content. 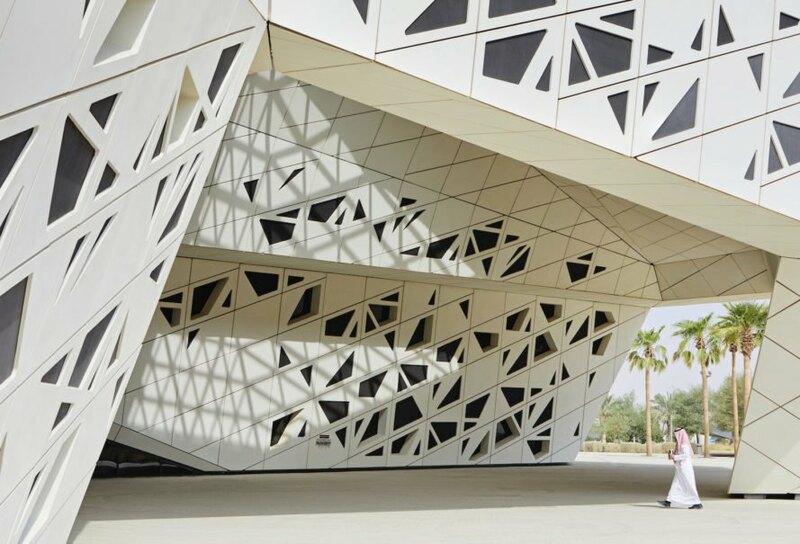 Despite its name, the King Abdullah Petroleum Studies and Research Centre (KAPSARC) is big on renewable energy, as evidenced by its LEED Platinum certification—the first of Zaha Hadid Architects’ projects to receive the title. Located in the Riyadh Plateau, KAPSARC is a non-profit dedicated to studying energy and their environmental impacts. The crystalline and futuristic campus recently opened to the public for Saudi Design Week 2017; the Honeywell Smart Building Awards program named the project Saudi Arabia’s ‘smartest’ building after its many eco-conscious features. 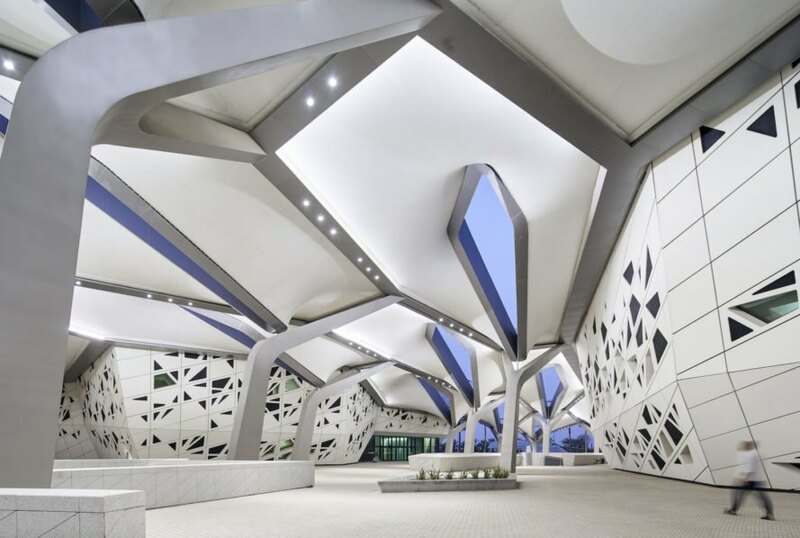 Made up of white hexagonal prismatic honeycomb structures, KAPSARC uses its partially modular system to optimize solar orientation, increase connectivity, and maximize daylighting. The building massing and facade optimization helped the structure achieve a 45% reduction in energy performance (compared to the ASHRAE baseline standards), while the solar array that tops a south-facing roof provides renewable energy with a capacity of 5,000MWh per year. “A research centre is by its very nature a forward-looking institution and KAPSARC’s architecture also looks to the future with a formal composition that can be expanded or adapted without compromising the centre’s visual character,” wrote the architects. The 70,000-square-meter campus comprises five buildings: the Energy Knowledge Centre; the Energy Computer Centre; a Conference Centre with exhibition hall and 300-seat auditorium; a Research Library with archives for 100,000 volumes; and the Musalla, an inspirational place for prayer within the campus. The facade features a strong protective shell to shield the interior from the harsh climate. All KAPSARC’s potable water is recycled and reused onsite while all of its irrigation water is used from non-potable sources. Forty percent of the campus’ construction materials were locally sourced and thirty percent of the materials are made with recycled content.